The economics of a cable car is contested. The MWCC forecast a $100M a year economic boon; opponents see a white elephant. Redaction: The macro-economic report's key economic data redacted. The MWCC asserts that an "independent" macro-economic assessment (written it was suggested, by the respected economist Saul Eslake) "hailed by many independent experts" had been confirmed by the Tasmanian Development Board's Coordinator-General. The bottom line was that the scheme would generate up to $99.91 million dollars each year. The Report was not made available. Until 2017. In 2017 their key analysis was publicly released through a Freedom of Information request—and the proponents have been quiet on their economic miracle ever since because it refutes key claims made by company spokespeople and discloses a dozen damning economic impacts of the proposal. The study's author was not Eslake—he wrote nothing more than a lukewarm, three paragraph Foreword. The overall economic impact is dramatically lower than boasted. A cable car would have only a small net economic benefit to a state where the tourist economy is in over $25 billion. Its employment potential was "inconsequential" . The report noted that as operations could easily be arranged to avoid payroll tax, the benefit accrued almost entirely to the proponent. At the heart of the report was the macro economic impact calculation from which the fabled $99M figure is scooped. That amount of net economic activity is not a forecast or a prediction. It is merely the output of a model. An economic model is, as the economist Richard Denniss says, "the slot car as to the racing car. It looks the same but it is nothing really like the same." Any millions "generated" are not a tribute to the generative power of the venture itself; the figure is merely the output of the model's engine which assumes a 1:1 multiplicant of tourism spending. It is called a "Multiplier" because it multiplies everything you put into it. Every and any $30 million spent by tourists on any activity would produce the same macro-activity level result. The result begs the question: how was the revenue (multiplied by the model) calculated? The macro-economic report relies entirely upon the Feasibility Study that created the revenue figures. Whatever figure is put in the Multiplier determines the result. The Feasibility Study has not been released. It is a black box. We only know that it was written for the MWCC by its controlling company Riser + Gain. Not a business analyst or a facility managers or an economics consultant, Riser + Gain is a property development business trying to promote and sell its own property. The MWCC's Macro economic benefit model is a kind of magic pudding. No doubt a cable car would generate revenue. No doubt financiers have sharp pencils and have tested the business, but also, no doubt, no estimate is underestimated. The very precision of the sums quoted in the Macro-economic Study is a warning. Calculating the effect of a hundred million dollar project to within ten thousand dollars makes it sound more credible, but such precision typically indicates the opposite of accuracy. It is a classic tactic of economic model tampering to state highly specific numbers even though no such precision exists. The models in such studies have a second layer of uncertainty in them. They require assumptions. The study says the project would produce somewhere between $67 and $99 million. This is a significant difference and the report attributes the difference almost entirely to the impact of a single user group that makes "a considerable [i.e. one third] contribution to the overall economic impact". That group is MTB enthusiasts. Mountain bikers. But there is a major problem with this assumption. Another valuable cable car rider is assumed to be the free and independent traveller segment. The model predicts that the bulk of them will use the cable car, but faced with a pricey cable car ticket, how many will opt for the almost inconsequential cost of the petrol to drive themselves to the top? As no figures or justification for this assumption is given, it is likely to be exaggerated. Inclement weather figures largely in the model. It is calculated as a positive because bad weather is assumed to induce some free and independent travellers to stay an extra night awaiting better weather. But as inclement weather may, equally, cause potential users to leave early, it is more conservative to let the two effects cancel each other out. The consequence for the revenue is a reduction. Local tour bus companies and many taxis ferry cruise boat passengers to the summit. By curtailing or transferring to the proponent these transport values, in sucking visitors from Port Arthur and Boonerong Park and Richmond vineyards, the spend on the MWCC is simply a transfer. It is not new, enriching activity. It is merely Amazon come to town. All the little guys are driven out of business. The macro economic study totals revenue from souvenir sales, food and drink and other sundry economic activities not directly related to the cable car itself. A café at the Pinnacle does not require a cable car. These figures unfairly inflate the equation. They are not generated by the cable car. In summary, it may be argued that, according to the model, the economic activity is not $90 million, but probably closer to $30 million gross. In fact, Net, it is considerably less because against any activity must be deducted the costs. The MWCC study assumes that the proposal has no costs beyond its construction cost. Is that right? Blithely arguing that "as the cable car will not pass any residences, there will be no loss of amenity", and further, "if there is a loss of amenity, it will be mitigated" (how? ), the model does not include this cost and “no attempt has been made to quantify the loss of amenity in this study.” But that loss is real. Deduct $5 million. "The study does not capture environmental effects” yet it claims that "the carbon reductions is a net environmental gain." It also blithely and contradictorily claims that "there will not be any negative environmental effects". This is unbelievable. Ecology teaches us that is impossible to do just one thing. The environmental impacts are manifold. Deduct $5 million. Every project has opportunity costs, but the MWCC economic report hardly considers them. The proposal precludes a raft of alternative economic activities on the mountain. The study does not calculate the opportunity cost (i.e loss) of numerous potential business opportunities leveraging the mountain as a wild, playground that could change mountain visitation from a 30 minute drive experience (or a one hour cable car ride) to an all day, all stay another night experience. Deduct twenty million. A further crucial negative impact is not even mentioned: Brand. Tasmania is natural, green, unspoilt, wild. That’s why tourists come here, that is what they come to see. The cable car damages that brand and this cost alone, arguably, reduces the benefit to zero. Most likely these costs were not explored because none of them would be borne by the proponent. It is not known how many of the shareholders in the MWCC will be residents of Tasmania. All shareholders not residing in Tasmania would be takers, would drain the economy of the benefits accrued by the activity. They would be profit-takers. Leaches. The main leach would be the bank. The MWCC informs us that its venture may fail. In that case they will sell its parts on the global second-hand ski-lift market. "In the highly unlikely event that the venture is a commercial failure or fails to provide an adequate return on investment, several options can be actioned, but as a last resort, the system will be decommissioned, dismantled and any restoration that might be required paid for by our own money, kept in a special trust fund: the Capital Reserve Trust Fund". If this makes you nervous, don't be. "Members of our project team have been involved in a number of installations and relocations for these purposes and understand the process well." We have a few questions for the understanding members of the project team: Considering that these second-hand, dismantled cable car parts will be at the bottom of the world, where are they going to be sold and how much will it cost to transport them? What Australian ski field would buy used cable or old towers from Tasmania? Who would want two, second-hand aerial buses emblazoned mwcc? What of the concrete towers and the Pinnacle Centre itself, the three-storried car-park, what value would these have on the global second-hand ski-lift market? This is crazy talk. The MWCC will to do everything in its power to make money flow uphill. What might that result in? Does a price put on the mountain change the mountain itself? To purists, yes. A private corporation benefitting from a public asset is abhorrent to some. Over the past century, the public has spent millions on the mountain. Why should one corporation appropriate that? A combination of inaccurate financial feasibility studies or unforeseen circumstances may conspire to make even an at-cost price prohibitive. What then? To stimulate tourism and protect jobs, would the government end up foregoing all fees and providing free services or giving financial subsidies to the venture? There is no guarantee it will not be asked and there is no security deposit offered. 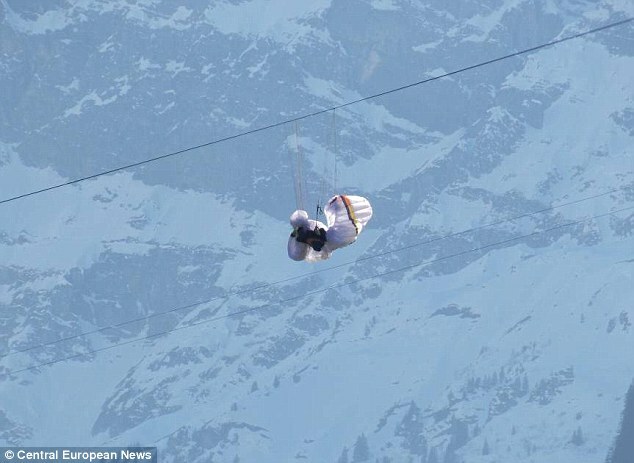 Alternatively, if the cable car does not attract enough usage for itself as an experience, there will be pressure to allow the company to provide attractions at the Pinnacle to woo visitors to pass through the fog to reach, say, a health spa, an alpine swimming tarn, an obstacle course etc etc etc. Pricing the mountain experience is the tip of a commercial iceberg that would utterly transform the mountain. It is not only very tempting but it may become essential for the MWCC to ensure its commercial viability by reducing or monopolising the access; ideally, by becoming the sole means of reaching the Pinnacle. The company denies that it would ever seek to "close the road", but it has stated that the mountain top is "an exposed car park encircling the pinnacle like a shrine to the automobile". Their argument would be: "close the carpark". Relocate the cars (with fewer spaces) to, say, The Springs. True to their word, they would notbe closing the road, they would be restoring the intrinsic value of the Pinnacle. It would be a mere side effect that all visitors to the Pinnacle would then have to pay the MWCC or walk. 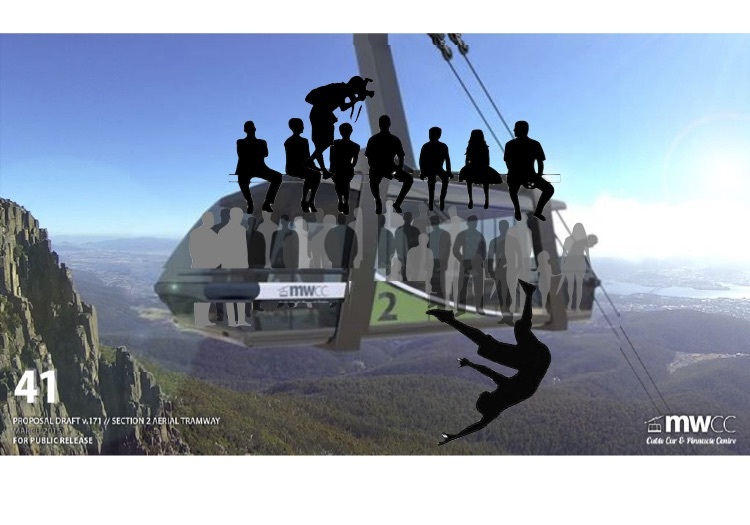 • Contrary to the MWCC's claim that a cable car will "grow Tasmania’s tourism appeal", the report categorically rebuts this: “the cable car does not, in itself, drive new demand.” It is not a tourist attractor. The cable car is a cannibal that feeds off tourists already attracted to Hobart. It rides on the coat tails of increased visitation and increased spend. “It is unlikely to induce additional demand”. • The study did reveal the mystery of the ticket price and the cable car’s projected revenue. The revenue is, by definition, half the economic activity, so the predicted revenue is $30 million, and the basic ticket price is $100. Revenue divided by ride visitation + F&B (food and beverage) on 300,000 trips = $90 return ticket. Cheap seats may be available outside the skybuses. There is only one justification for the cable car: tourism. But tourism must servethe community, not destroy its way of life, not "slash the face of the mountain with the flick-knife of greed" as Richard Flanagan argues. The major argument advanced in favour of a cable car, as Geoff Law put it, is that the mountain attracts 300,000 visitors a year "impotently waving around $50 notes". For these frustrated consumers who whinge that ‘You can’t get a cup of coffee on the mountain' the MWCC argues: 'Build a cable car.' To their own whinge that 'There’s no proper visitors centre on the mountain' they propose: Build a cable car. Despite the fact that the proponents are in love with their cable car as an artefact, few people will come to see it. A cable car would attract users, but the question is, are they attractive? That is, are they worth the cost? Will the MWCC pay to mitigate the inevitable damage that these visitors will require to be done in order to service them? The MWCC began with the suggestion that you couldn't get a coffee at the summit. They ended up with an all-day cafe, a restauraunt, a wine bar and a whisky bar. On the grounds that the facilities were inadequate, they have hit upon building an interpretation gallery/education centre, an amphitheatre, toilets, a parenting room, seating, board walks, and an emergency shelter. Overkill? The cable car is a mass transit system. It demands masses of users in order to profit. Who are these masses? The MWCC acknowledges that the cable car is not for locals (here). Many will refuse to use it ever. Others won't because it's not going where they're going. The mountain has a hundred beauty spots, the proposed cable car goes only to one. They don't want to queue, and they are nature lovers, not bus lovers. Some will, no doubt, use it while acting as guides to their own family-and-friends visitors. And many may use it on one of the very few days when the road is closed. But mostly, they won't use it because they have cars and the price point where it is cheaper and more convenient than their car is unlikely to arrive. In their projections, while 285,000 locals use the road now, once the cable car is built this will only fall to 237,000. 50, 000, but this is undoubtedly exaggerated. We suggest 20,000 is realistic. Over 300,000 tourists drive up the mountain each year. The MWCC claims that 80% will abandon their hire car and take the cable car. No evidence is offered and the figure is unrealistically high. We suggest that 75,000 is more realistic. The great mountain-bike track starts at the Springs and ends in Glenorchy, far from the proposed cable car base station and the Pinnacle Centre. In order to capture these users the MWCC proposed a new track from the Pinnacle to The Cascades, but the route was too dangerous and the cost of making it safe was exorbitant. Everyone agreed the money would be better spent elsewhere. There will be no stampede of mountain-biker users. The MWCC says of Para-gliding: “Park, Ride, Fly, Repeat." Sounds easy. But kunanyi is not easy. It is not a destination for beginner or intermediate flyers. It is only for experts—elite flyers—and they are rare birds. The idea that the summit of Mt Wellington could be used for a Gliding school or for tandem joy-flights is, experts say, "nonsense". Flying from Mt Wellington is for experts and no nearby landing area suited to training or joy-flights exist. Moreover, the zone the MWCC would control at is unsuitable for launches because it has too many large boulders and the the slope gradient is insufficient. A better, approved site already exists. In short, no market exists. Read more... here. Cross-country skiers? See snow report here. They are not going to come. Zero users. The MWCC says cruise ship passengers will be the most frequent users of the cable car, and during peak seasons claims shuttle buses will be departing every ten minutes, fourteen hours per day. Although their traffic management claims that the cable car would not operate during peak traffic periods. Cruise ships, for all their vast numbers, offer scant economic benefit to the city. Backpackers are far more valuable than cruise ship passengers, says Luke Martin, CEO of Tasmania's peak tourism association. The number of cruise ships docking is sure to fall. Moreover, the valuable cruise passenger nowadays is, according to Toby Biddick (manager of shore excursions for Abercrombie & Kent) no longer the cable-car kind of goer who seeks "hyper-active, jet-set, fast forward, artificial island" experiences. The cruise ships that will be permitted will be filled with new cruisers who seek: "no traffic, plenty of time, slow, unspoilt nature, and who appreciate and want fairness". They will not fall for a mass transit, sham visit. The MWCC forecasts 500,000, but this too is grossly exaggerated. There is a season for cruise boats, too. They will certainly not be boosting tourism over winter. If Hobart finds its way onto their sea lane of a coming super fleet of Chinese cruise ships, hundreds of thousands of users are possible. This is the market the MWCC gloats over in their Macro-Economic Impact Report. But will the fleets be built and will they come here?